Anita Kesavan Srinivasan works as Director of Programs, Executive & Professional Education. She joined U of T ‘s School of Public Policy & Governance (SPPG) in 2007 and was part of the senior leadership team that launched the Master of Public Policy & Executive Education programs. Her past positions have included managing an array of programs and leadership initiatives at the Maytree Foundation, United Way, Centre for Education and Training, Peel Board of Education. 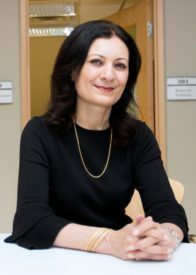 She has been involved in the community with People for Education; the Parent Voice in Education Project, Ministry of Education; Nahani Way and Applewood Heights School Councils (Mississauga); The Munk School’s Public Good Initiative; former Board Member of the Education Quality Accountability Office (EQAO) and Sampradaya Dance Creations.